Supplied exclusively by Radium Engineering, their Catch Can system for the Ford F150 Raptor includes both the PCV and Crankcase Catch Can Kit. Both kits are easily installed on existing mounting points and plumbed using existing ports. 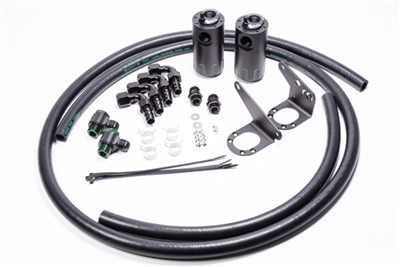 For the ultimate in engine protection, Radium recommends 20-0483 Dual Catch Can Kit, Ford F150 Raptor. This kit utilizes both the "CCV" and "PCV" catch can kits detailed above. A shim is included to allow the PCV mounting bracket to sit right over the CCV mounting bracket, as shown above.